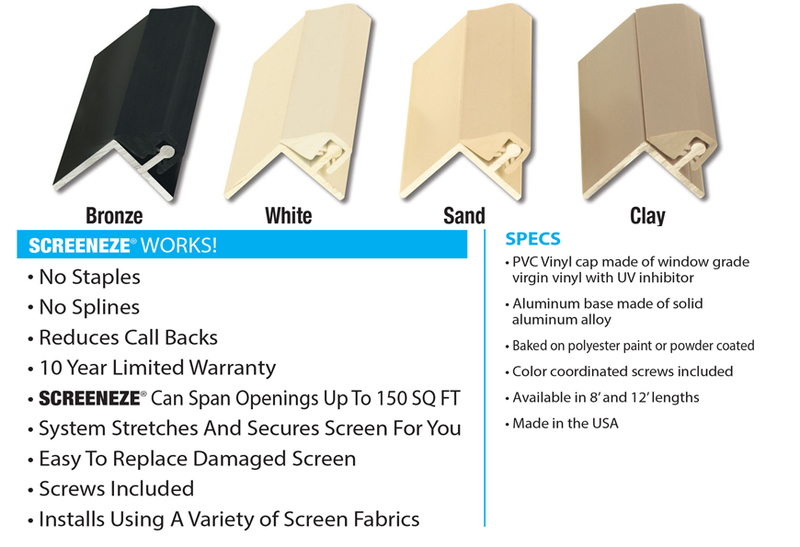 - Flat Bar Kit: For arched openings or other custom openings. ScreenEZE can be used for screen panels as large as 10' x 15', and it is easy to cut it with a 10" miter saw to create the right size sections for your application. Take care when installing at temperatures below 55 degrees, as vinyl caps can snap. Replacement vinyl caps are sold individually should breakage occur. *White & Bronze screws = T-25 star drive, #9 x 1-1/4"
Clay screws = #2 square drive, #10 x 1-1/4"
Click the button below to add the 8' Sand (10 Pcs Min) to your wish list.